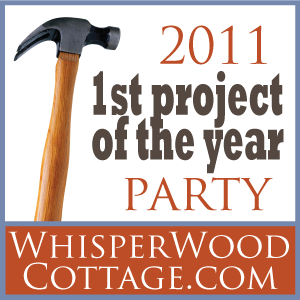 WhisperWood Cottage: Vintage Items: Perfect Ingredients for Cottage Style! Vintage Items: Perfect Ingredients for Cottage Style! 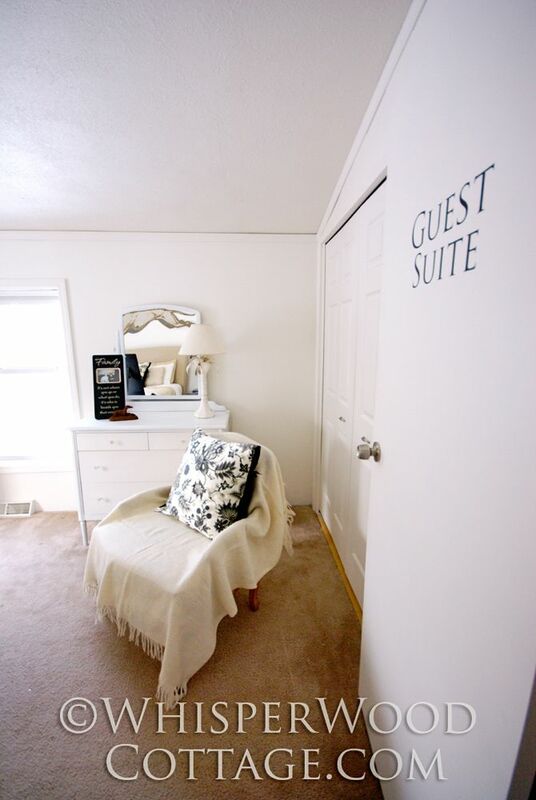 Welcome to the "guest suite" at WhisperWood Cottage! After the 5-minute door lettering project from yesterday, I thought I'd show you the rest of the room as long as you're here! There are a few vintage details throughout the rest of the space that I adore, and I think you might like them, too. So, come on in! The bergére chair above was a $60 garage sale find several years ago. With its tulip upholstery in mint condition and the cutest little old lady trying to find caring, new homes for her favorite pieces (she was down-sizing and moving), I couldn't say no. Tulips are "our" flower, too, so it has extra meaning for Ron and me. You can see the chair better in a previous post about the master bedroom makeover. Tulips didn't seem to work for the fall and winter, so it is currently covered with a wool throw to fit in with the neutral tones of the room. In the spring, I'm sure it will bloom again! The wool throw was a gift from the in-laws. L.O.V.E the visual texture! 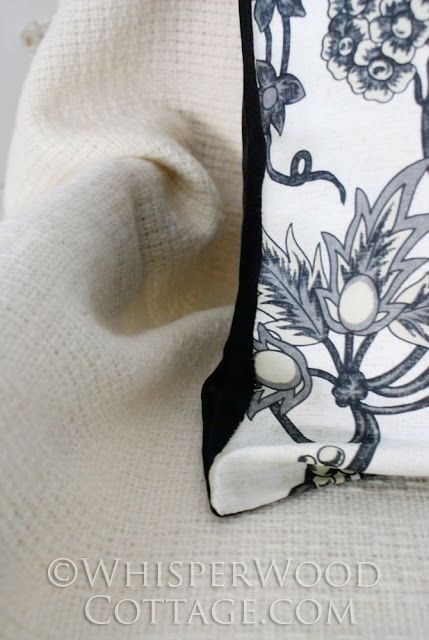 I totally dig how it contrasts with the color, pattern, and sheen of the silk pillow covers (actually a TJ Maxx find). The vintage metal dresser was an occasional sale find from Mustard Moon. Metal furniture is über cool in my book. It received a recent makeover involving whitening and brightening with spray paint. The white tole (metal) palm tree lamp was an estate sale find...I think it was $1 or $2! I love tole, and was quite happy with the price!! 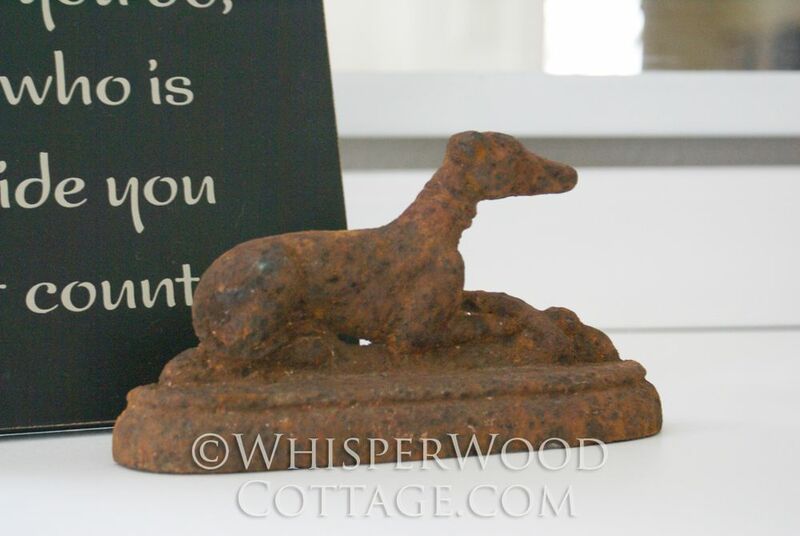 Atop the dresser is this great rusty, crusty metal greyhound (possibly a whippet, which is similar to a greyhound) figure. It's flat on the back side, so I think its original purpose might have been as a bookend. I found it on last summer's trip to Oronoco Gold Rush Days in Oronoco, MN. I hope you are enjoying the mix of garage sale, estate sale, occasional sale, flea market, and discount store items. I think they are the perfect ingredients for easy cottage style! The tour continues in the next post. I'll show you a salvaged project that has special meaning to me! How comfortable your guests must feel! And they'll always know which room is theirs! Love the texture on the greyhound bookend and the contrast with all your white. The patterned pillows are gorgeous. Are they deep blue or a black/charcoal? I have a palm tree style lamp. Love your white one. Hmmm? You know I love that greyhound. I think it may have been a doorstop. 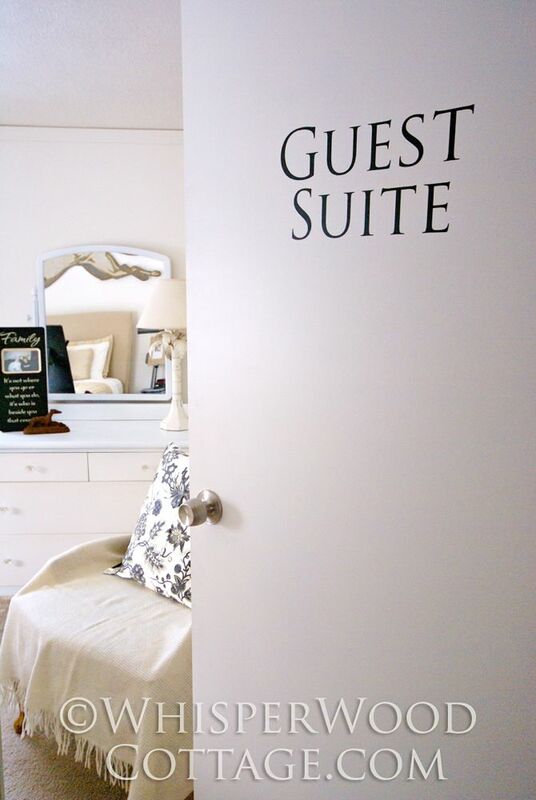 Whatever it was before, it's great in your guest suite now. 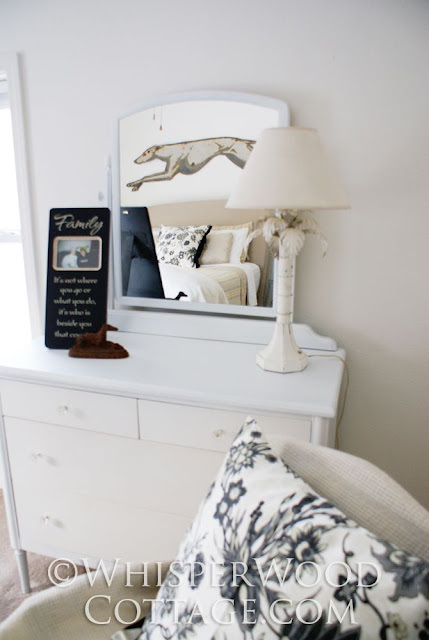 Your guest room is very pretty, I love the huge Greyhound above the bed and the little metal whippet. It might have been a door stop, something people used to use a lot, way back when. Just a thought.